Whether you’re a photographer or a hair stylist, we all have to deal with client meetings. For many of us, this can be an uncomfortable and nerve-racking thought, especially if we are new to the industry, particularly young or simply a bit introverted. So I’ve come up with ten quick tips so you can give great client meetings with confidence. Let’s go! Choosing a suitable meeting location is generally governed by the type of photography you specialise in. If you are working in the family or newborn portrait industry, it might be more appropriate to set up the meeting at the client’s home. This might make clients with young children or who are heavily pregnant feel more comfortable and relaxed. Also if you plan on organising the photo shoot at the client’s house then you can have a preview of the surroundings you will be working in. On the other hand, if you work within the wedding or commercial industry you will probably want to choose a neutral, public location. Remember that the venue you choose will set the tone for the whole meeting so make sure you pick somewhere that’s local to both parties, that you know fairly well and feel comfortable in e.g. a local coffee shop, laid-back restaurant, hotel or meeting room. I would recommend arriving about thirty minutes early. This will give you the chance to park, get to the location, set up and settle down before the client arrives. You will appear a lot more professional if a client turns up to see you ready and waiting than to meet in the car park with you trying to unload your boot. Greet clients professionally but warmly. Remember you’re not their ‘mate’ but you want to make them feel comfortable and relaxed in your presence. Make sure you give clients a strong handshake, a smile and a warm welcome. It’s also a nice touch to offer them a drink or something to eat before you get started! Get to know your clients a bit before talking to them about your business. Remember that this is an interview just as much for you as it is for them. This doesn’t have to be knowing their life story but ask them some great questions. This will show that you really care about who they are and what they want from you. Try to ask questions that don’t always have a ‘yes’ or ‘no’ answer, as this can end up a bit repetitive. I’ve included some examples below. What names have they thought of? Is this their first child or do they have other children? How old are their other children? How are they coping at pre-school/school? How do they feel about the new arrival? Are they looking forward to their photo shoot? Are the pictures as a gift for someone else or are they just for the family? Where are they planning on having the wedding? What style of wedding are they imagining? What flowers are they going to have? Have they decided on colours? How far have they got in the wedding planning process? Tip: Try to have some pre-planned questions that include the groom as weddings can become a bride-only conversation. You want both parties to feel included and valued. Speak confidently about your products, packages and pricing. You need to believe in your business to convince anyone else to believe in it too. Remember that when it comes to your industry you are the expert of the group, so try to educate you clients on your business. Why have you only got a select number of products? Why do you charge that amount? What do you expect from your clients? What does each package include? How can clients get in contact with you? The more you can educate your client, the more trustworthy and professional you will seem. Make sure you speak up and make eye-contact with the client. No one is going to want to invest in someone who looks at the ground and sounds like they’re talking in a library. Also really listen to what your clients are saying. There is nothing worse than feeling like someone isn’t interested in your conversation. So make sure you’re fully engaged and not faffing with paperwork or albums while they’re answering your questions. Tip: Make sure that your phone is switched to silent while you’re with the potential client. Don’t even think about texting, answering the phone or replying to any emails for the time you’re with the client. If it’s important they’ll leave a message! If you’re fairly new to the photography industry or haven’t had much experience with client meetings in the past, it can all feel a bit intimidating and overwhelming. 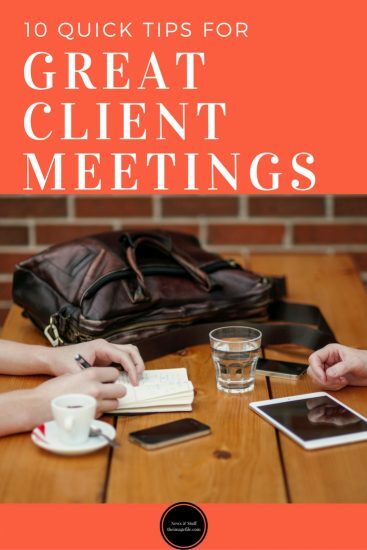 However, the main thing to remember is that the only reason a client has agreed to a meeting is because they like your work and want to get to know you better. So make the most of it! SO WHAT IF THEY DON’T BOOK YOU? A client might not book you for any number of reasons. They might have re-worked their budget and now cannot afford you? They might have given up the project altogether? The main thing to remember is that it doesn’t matter that they didn’t book you because they still had a positive experience with your brand. This means they’ll hopefully share good things about you and your business or even book the project at a later date! Tip: Even if they don’t book your services, make sure you send a follow-up email, letter or notelet saying that it was lovely to meet them and that if they have any other questions feel free to contact you. This ends the client relationship on a high note and shows that they are welcome to come back to your business in the future. Check out this blog post is you’re interested in finding out more about converting inquiries into sales! What do you do to give a great client meeting? Do you have any tips on getting over the initial nerves of meeting clients?